My Instagram handle is @Crafty_Mommy_Blogger. I LOVE crafting Onesies, bows, pacifier clips, and random awesomeness for my Nieces and Daughter. I've decided to give my lovely readers a few tutorials in a segment I'd like to call Crafty Mommy Mondays. I first saw this nice idea on Lime Lane Love! 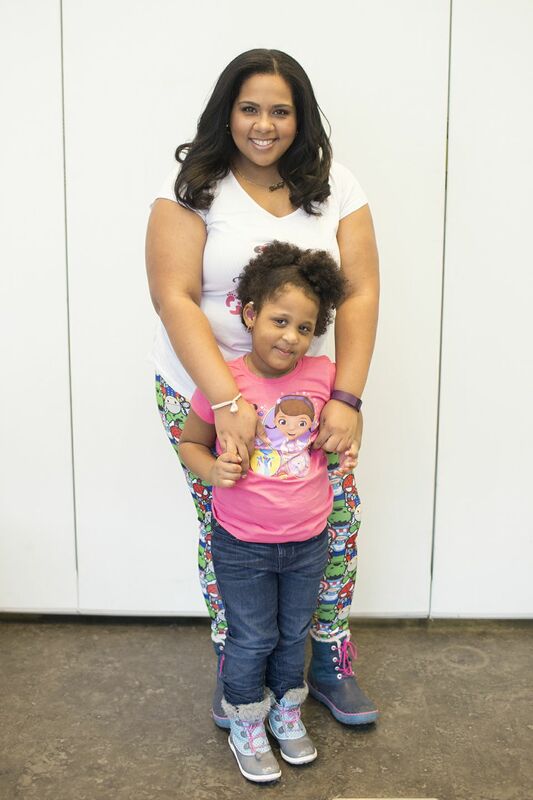 Rather than a double digit Age, I made a single digit since my niece was turning 9 at the Time. 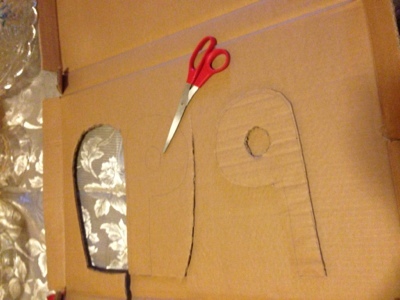 (1) Take your cardboard and pen and draw your desired number , or shape, **It's better to do it one side at a time due to the cardboard being too thick to cut. (2) Next, you cut out the number or image you just traced. 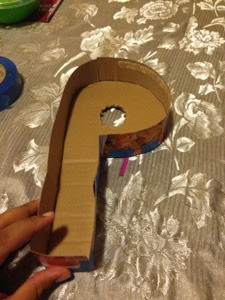 You then Use the piece you cut out to trace the other side of the piñata. 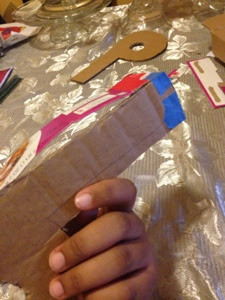 (3) With your ruler, measure a 1 1/2 inch wide, long strip of the cereal box and cut it out. ** Cut many pieces the same size since you won't know how many it will take to cover all the sides. (4) Now that you have your Strips, Desired number or shape, and tape we can start the assembly part. 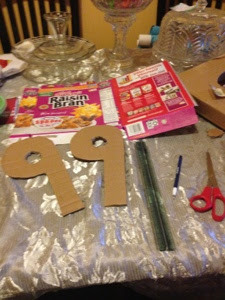 Start on any part of your piñata ( I started from the bottom since my number was a 9 and its the smallest part of the number). Wrap your strips around the edge of the number and Tape it as you go. If you need a longer piece, just add it at the ends of the first strip. ** Remember to leave an Opening for the goodies to go into. (5) Once that step is completed you'll need to position the other side and tape it to the strips as well. ** I forgot to put a strip around the middle of the 9 and remembered after I taped the 2nd side, but you have to wrap strips around every opening so that the goodies won't spill out. (6) Decorating : Grab your party streamer and start decorating the piñata any way you desire. 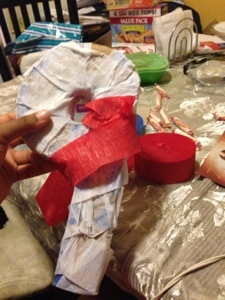 I used a Gluegun to keep my piñata a little neater (I love my Gluegun lol). (7) Once you finish putting on the streamers, you can embellish any way you want. I got iron-on Studs (for 20 cents a pack at a sewing warehouse sale!! It comes with about 500 studs!) 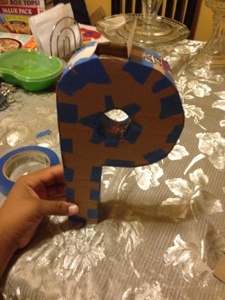 I grabbed my Gluegun and put the letter K in Studs on the piñata. 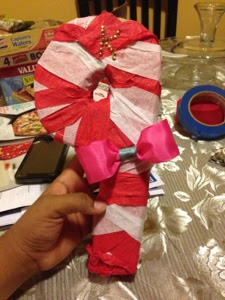 along with a Wired Ribbon Bow. (8) Add The Candy, toys, money, confetti, etc. I filled it with her favorite Chinese candies and she was ecstatic. 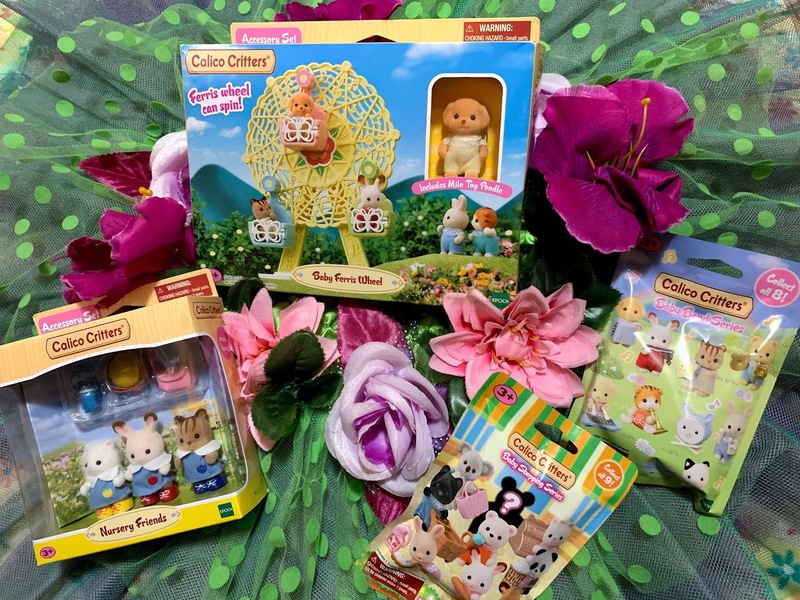 I Put it into a Birthday care package for my niece and she was Over the MOON! I can't wait to show you what else I've made being the crafty momma I am. Nice!! I've actually always wanted to make a pinata. Very clever! That is super cute! It was very creative the way you put it together. How fun! My kids would love it.